FlashDogs are an international community of talented and supportive flash fiction writers. I’ve been at the core of most FlashDogs activity since the start, but I’ve taken a sabbatical to complete my first novel. I had some time available and couldn’t think of a better way to spend it than catching up with some good folk from the community. Today I’m spending time with FDHQ legend Emily June Street. Writer of magic (in more ways than one). Luminous Creature. Valued friend. Incredible flash fiction champion. She also might be a prophet on future transportation issues (Cambridge might be a model city, by the sounds of it). 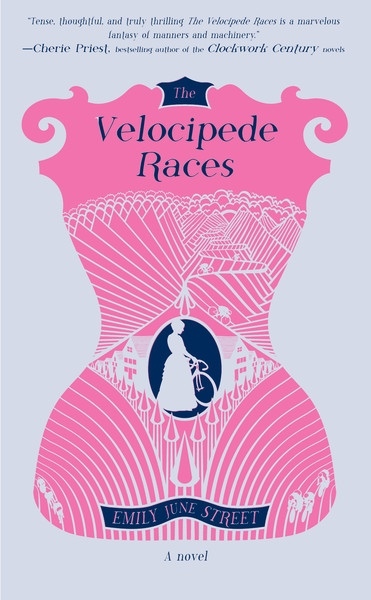 By some strange (and genuine) coincidence, today, 12th April, happens to be The Velocipede Races book launch day for Emily. Congratulations, EJS. EJS: My first protagonist was Leila of The Gantean, which was the first novel I wrote. She was inspired by Buddhism, non-attachment, and the concept of water. I wanted to try to write a character who flowed rather than fought. It turns out this was more difficult than I ever imagined. Characters who avoid conflict can be tricky to write as engaging protagonists. I went through so much trial and error before I found a voice and a plot that suited her. EJS: Well, let’s say my current project is the entire seven-book Tales of Blood & Light series. It’s hard to imagine that series ever being done, but I do have several other novel-germs waiting for me. I’d really like to finish this sci-fi time-travel intrigue novel called The Body of Annalys Viseu. One morning I woke up from a dream of the first scene of the book, and it does feel imperative that I pursue that story, even though it’s intimidating to fully imagine a fleshed-out and realistic future for the setting. EJS: My Sunday morning Pilates mat class recently made me cry with laughter by doing impersonations of Donald Trump teaching Pilates. For days after, thinking of it would send me into little giggle fits. EJS: Since I’m usually arriving on a bicycle, I take off my helmet and cycling shoes, and then I get a glass of water. I head to the computer to do the day’s bookkeeping. My dog, Stella, comes to greet me when she can drag her old bones off the bed. Pretty boring, I know. EJS: I really want to see London! Especially after reading your Metropolitan Dreams *(and a zillion other books set in London). 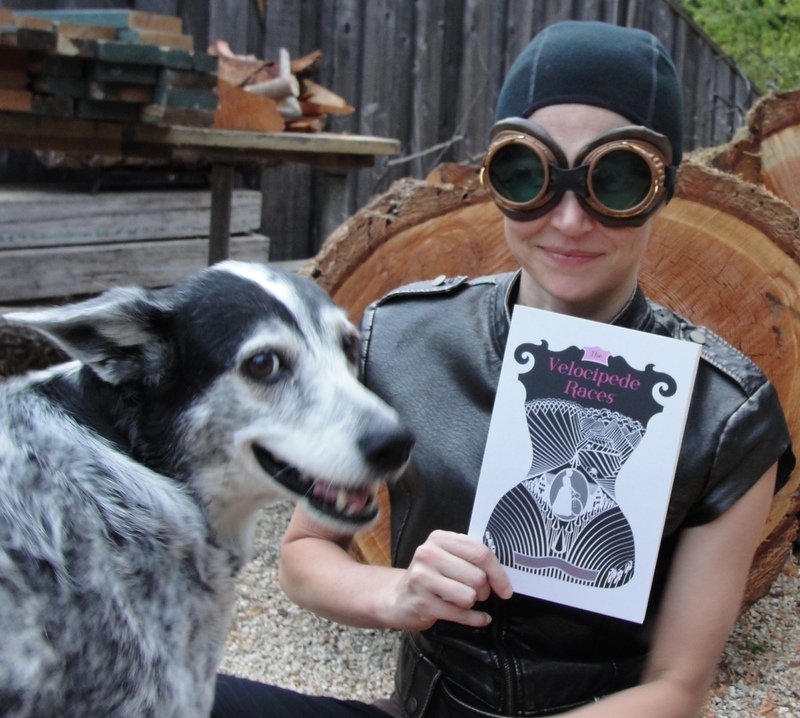 EJS: My book The Velocipede Races, published by Microcosm Publishing, is out as of April 12th! This particular story has had a long journey—but don’t they all? Velo Races was the first book I indie-published back in 2013, and it’s been so exciting to see it flower into a larger life as a traditionally-published book. I guess you could say I invented my own niche genre: quasi-historical sports-action femmepunk romance. A tough girl rebels against stifling gender rules in a steampunkish world, dreaming of racing her bicycle in the cutthroat velocipede races. 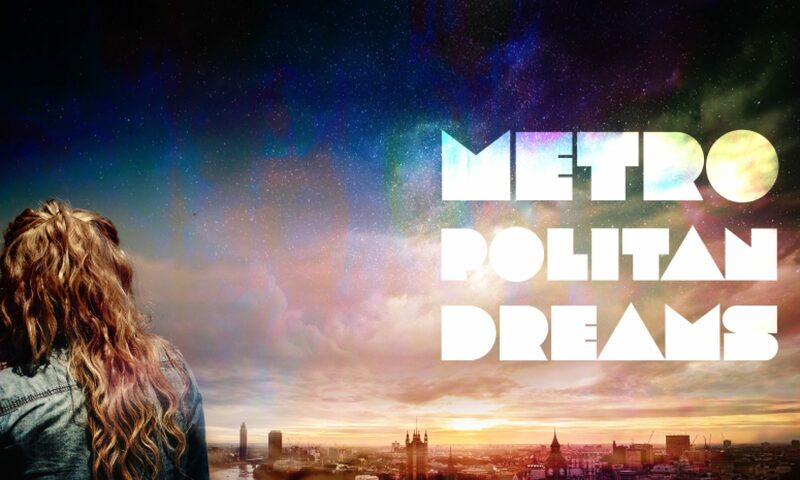 But can her dream survive scandal, scrutiny, and heartbreak? The Velocipede Races is a feel-good story (a rare thing for me to have written!) about overcoming obstacles and making room in the world to be who you truly are. In it I explore two of my big interests: bicycling and feminism. MK: It is one of my favourite novels of the last few years. EJS: My family didn’t do much traveling beyond California, my home state, while I was growing up. When I was in college I drove across the United States, which was an eye-opening journey, although looking back I don’t know how I tolerated it, since I can barely stand to be inside a car for more than a half-hour these days. Visiting the rest of the United States made me see the contrasts of America in higher relief and helped expand my awareness of the world. I didn’t leave the USA until I was 23 years old, when I went to Peru for an epic journey through the Amazon rainforest and into the Andes to Machu Picchu. I’ll never forget the feeling after driving for six hours over rutted roads, then going up the river for hours in a dugout canoe, and finally arriving at our camp at Rinquia. I felt, for the first time in my life, as though I’d escaped everything—the nearest civilization was over six hours away. I’d entirely left the world I knew behind. That’s a big, empty, strange feeling. EJS: I’m into simple solutions to big world problems—that’s really my only interest in technology and invention. What can we do to help people live healthier, happier lives, and how can we raise the standard of living for those most in need? I like technologies that serve our human needs rather than only our desires. It’s interesting that two out of the three examples you gave me have to do with transportation (flying cars, teleportation). Allow me to ride upon my bicycle advocacy soapbox for just a moment. The thought of a flying car—if power by petroleum—just makes me sick on every level. I hate cars on the ground; I’d like them even less in the air. What we need in transportation right now is infrastructure that encourages people to use public systems and their own human power to get places. People are suffering—and quite literally growing sick—from a too-sedentary lifestyle. Traffic and air-quality is getting worse in urban centers all over the world. Everyone’s consuming a great deal of petroleum. Cars are part of the problem. In transportation, I’d like to see problem-solving focused on new technologies that help people use their own power and address this issue of a too-sedentary lifestyle in a way that people are willing to use—maybe a human/solar hybrid vehicle? I’d also like to see us address the human behavior that prevents us from using the simpler solutions (public transport, bicycles, our own two feet) that already exist. We should be asking: what do people need to feel safe, comfortable, and happy using healthier modes of transportation? What is preventing people from using them right now, and how can we address those roadblocks? For pure whimsy though, I’d love to see a flying bicycle/human-powered flight machine. I’d commute on that in a heartbeat, though riding my Merlin is almost like flying as it is. EJS: I just finished working with Tamara Shoemaker on the edits for her second book in her YA fantasy series, Embrace the Fire. I wrote her an 18-page global editing letter that would have made a different writer cry with dread and exhaustion. She just sat down and completed the work—in less than a month!—and then dove right into the line edits, which are intimidating blocks of comments on every single sentence. Was she afraid? No. Did she scramble around doubting herself and getting into a dither of dismay? No. Did she do the work and make her book great? YES! That inspired me as I set out on my own edits on my next Tales of Blood & Light book, Sterling (coming June 2016!). I love to see confidence in writers; it’s contagious in a good way, just as doubt is contagious in a bad way. You have a choice: you can give into the creative doubt, or you can work through it. The doubt is just an impediment, a tangle of briars you have to learn to negotiate. We all have to edit; we all have to wrangle each sentence until it satisfies its purpose. It’s part of the process, and the only way through it is to do it. That was delightful. Huge thanks to Emily for her time and continued FF (and beyond) support. Stay tuned, more interviews planned soon.